Twelve years ago today, the Senate passed the US-Morocco Free Trade Agreement (FTA), which remains America’s only FTA in Africa. In many regards, it’s not surprising that Morocco was the US’s first choice. As an historic trading crossroads between Europe and Africa, Morocco has always been an important global trading partner. Today, it is a rapidly developing economy—and one of Africa’s largest—with strong global trade links. In 2002, King Mohammed VI and President George W. Bush confirmed their intention to negotiate a Free Trade Agreement. Negotiations ensued in 2003 and were concluded by March 2004. In July 2004, both the House and Senate passed the bill to implement the FTA, and President Bush signed it into law in August. On January 1, 2006, it entered into force. While both countries have experienced a large boost in export value since then, the jump in US exports has been particularly high. 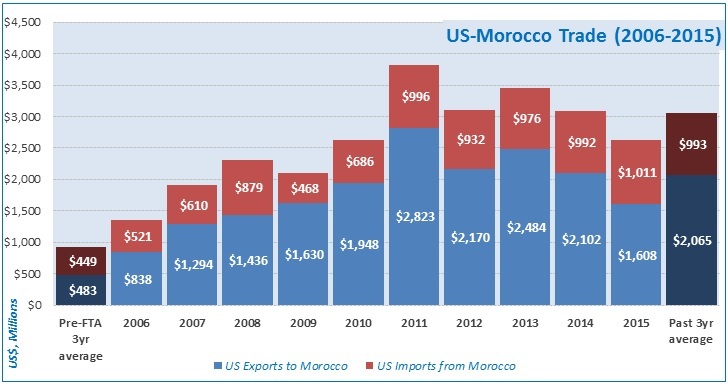 US exports to Morocco have increased in value by 328% since before the FTA, while Morocco’s exports to the US have increased in value by 167%. Compared to average exports before the FTA came into effect, 33 states (and DC) have more than doubled their exports to Morocco in ten years. The top ten US exporters to Morocco in 2015 were Texas, Washington, Louisiana, Virginia, California, Georgia, DC, Florida, Michigan, and North Carolina—together those states averaged a 728% boost in export value since the FTA was adopted. US Exports to Morocco by state in 2015. Data via the International Trade Administration (TradeStatsExpress). Leading up to the 10-year anniversary of the FTA coming into force, stay tuned for more history and analysis of US-Morocco trade relations. Based on average exports by value from 2003-2005, compared with the average exports by value from 2013-2015. Data via the International Trade Administration. Based on average exports by value from 2003-2005, compared with the average exports by value from 2013-2015. Ibid. Based on average exports by value from 2003-2005 compared against 2013-2015. 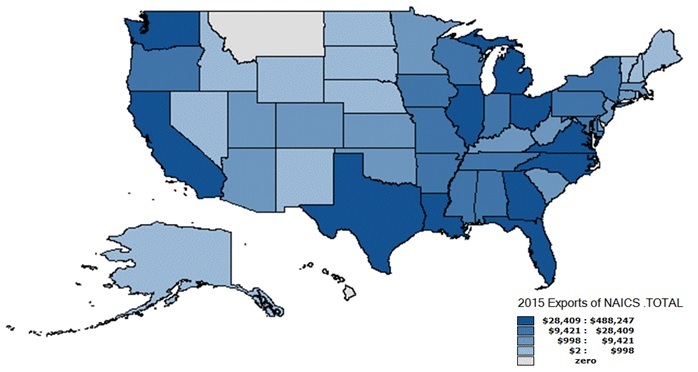 Those states are: Nevada, Idaho, Montana, New Mexico, West Virginia, Utah, Texas, Kentucky, DC, Mississippi, Iowa, Arizona, Tennessee, Michigan, Arkansas, New Jersey, Missouri, Alabama, New Hampshire, North Dakota, South Dakota, Illinois, Florida, Georgia, California, Pennsylvania, Oregon, Deleware, Ohio, Louisiana, Maryland, Virginia, Massachusetts, and Colorado. Data via the International Trade Administration.